Starbucks, the company that has taken coffee to the masses, is about to increase the size of its following. Remember early last year when I first wrote about the Trenta, a 30-ounce drink offering for iced and cold drinks at Starbucks? Well, the Trenta didn’t go away; in fact, the Starbucks Trenta is making its debut in 14 states as of today. The next debut area for the Trenta is California, which gets it February 1. After that, the company says the Trenta will be nationwide by May 3. 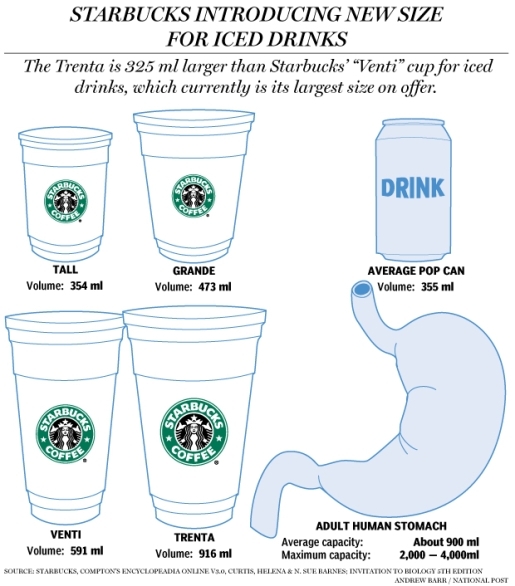 The Trenta’s final capacity is a staggering 31 ounces or about 916 milliliters. The average stomach capacity is 900 milliliters. I guess the company is saying you’d better be prepared to pee if you pick one of these bad boys up. When the smallest size of drink is off the menu and a gut-busting cup becomes the new it thing, I suppose you can say moderation is out the window. However, Starbucks says that while the size is impressive, the calorie content of its Trenta drinks is not. Unsweetened drinks are expected to have 90 calories or less, while sweetened drinks are a modest 230 calories. All in all, that’s not bad considering it’s a drink the size of a full meal!